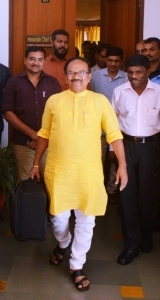 In spite of last year’s projected surplus budget getting pushed into actual deficit of Rs 1000 crore, Chief Minister Laxmikant Parsekar has once again projected a surplus budget this year. He estimates a revenue surplus of Rs 158.82 crore while maintaining his gross fiscal deficit at 2.84%, below the prescribed limit of 3%. In his last budget of the existing term, Parsekar has estimated Additional Resource Mobilisation of tax and non-tax revenue of Rs 382 crore. Though he did not reply to the last year’s disaster when asked, Parsekar however expressed confidence that the surplus budget won’t be pushed into deficit. Parsekar today presented a budget of Rs 14,694.17 crore in the House, which is 9.06% more than the last year. The plan capital outlay is also 10% more, at Rs 4008.05 crore. The budget estimates revenue receipts of around Rs 9362 crore, including Rs 2914 crore as the central assistance. On the other hand, revenue expenditure is estimated at Rs 9203 crore, including plan expenditure of Rs 3175 crore. In his budget speech, Parsekar said Goa has recorded 10% growth with Gross State Domestic Product estimated at Rs 70,400 core at current prices. He also said that Goa’s per capita income is the highest in the country, of Rs 2,57,490 crore at current prices.